Built completely out of plastic, the Lenovo IdeaPad 330 81DE00L0US comes from the Lenovo Ideapad 330 series. Despite its all-plastic build, it isn’t cheap-feeling and don’t worry about it scratching easily. The design might be simple and no frills, but that because it is a decent laptop meant to casual use. Further, it has enough processing power to muscle through daily tasks such as multimedia and web browsing. 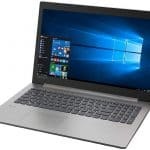 If you’re considering a laptop to use part-time with a decent amount of ports, display, and processor, the Lenovo Ideapad 330 81DE00L0US is a great choice. It sports an Intel 8th Generation processor, 8GB DDR4 memory, fast 256GB SSD and ultimately a very affordable price. While its components render it far from a powerhouse and poor at multitasking, we recommend it best for beginners and basics. That means it is sufficient for undemanding home office tasks such as web browsing, word processing, and some light gaming. Designed entirely out of plastic, the Lenovo Ideapad 330 laptop is both lightweight and budget. Although the plastic finish doesn’t make it look cheap, there is a noticeable difference with its predecessor, the aluminum polished Lenovo Ideapad 330S. Like its predecessor Ideapad 330S, it is easy to handle it, better yet carry it with one hand. And the plastic chassis remains firmly fitted on the frame such that there is no bending or twisting when opening or closing it. Weighing in at 3.96 pounds and measuring 14.9 x 9.5 x 0.8 inches, the laptop is lightweight compared to the Acer Aspire E15 E5-576-392H (15.02 x 10.2 x 1.19 inches, 5.27 pounds) and the Asus VivoBook F510UA-AH51 (14.2 x 9.6 x 0.8 inches, 3.7 pounds). The Ideapad 330 also comes in different colors which you can choose from. The main available colors are Platinum Grey, Blizzard White, Midnight Blue, Chocolate, and Onyx Black. On opening the inside you’ll notice the laptop has medium-sized bezels and connected to a silver polished palm rest. The hinges run all the way from the right to the left of the laptop giving it a firm grip of the system. Also, thanks to the flexible hinges, the laptop can lean back 180 degrees which is great for those odd sitting positions when you need the screen laying flat on the bed/table. Finally, the top bezel is home to a built-in microphone and webcam for video calls. 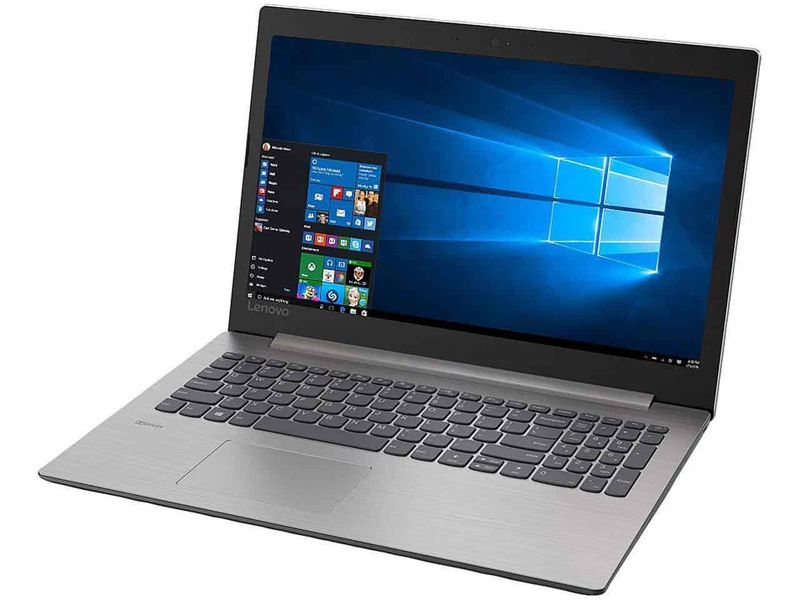 Unlike business laptops like the ThinkPad, the Lenovo Ideapad 330 has no biometric available for secure logins and Windows Hello. However, at the current price point, it is a passable trade-off. As far as ports are concerned, the Lenovo Ideapad 330 packs a complete assortment of ports. There is a full-sized HDMI connector, USB-A port and Ethernet port for your LAN connections. Lenovo included a single USB-C port but sadly it can only be used for data transfer and not charging. It’s clear Lenovo limited the USB-C’s functionality by using a less advanced USB-C port system. Other ports available include a 4-in-1 card reader supporting a bunch of formats such as SD, SDHC, SDXC, and MMC card. There is also a 3.5 mm audio microphone/headphone combo jack. The right side is home to a DVD+RW drive and finally a Kensington lock slot for securing your laptop in place. If you’re going to be using the internet, your connectivity options will be the 802.11ac Wi-Fi and Bluetooth 4.1. Our review unit includes an 8GB DDR4 memory and 256GB SSD storage. The memory is more than enough to handle word processing, web browsing, and multitasking. You can easily multitask a couple of open tabs on Chrome, binge-watch a movie on Netflix app, edit an image on Adobe Photoshop CS6 all at once. 8GB is plenty of memory for increasing demands and can literally handle up to 40 Chrome tabs, 8 media streams and 4 photos in Photoshop without performance becoming erratic. That’s all according to laptopmag’s how much RAM you need. Moving on, the 256GB Solid-state drive is great for storing data and files fast. However, it’s relatively low amount could frustrate many users looking to save multimedia galleries that they don’t keep on the cloud. To solve this problem, one might need to the laptop storage to a not-so-outrageously expensive option like 1TB hard drive or 512 GB solid-state drive. Doing a balancing act might be helpful so as not to spend way too much money unreasonably. Doubling the 256GB SSD to 512GB SSD will cost you $120. 1TB HDD might just set you back $370. With this in mind, it might be easier to figure out which is more important to you and whether the price is worth it. If you don’t necessarily need to store your multimedia you can opt for the cheaper option SSD. Lenovo included an Intel Core i5-8250U 1.60 GHz processor, fast low power consumption and low heat emission CPU. It makes a perfect processor this laptop as it is a great choice for users who want a fast laptop without compromising on portability and battery life. Combined with the 8GB memory, the processor provides amazing productivity for day-to-day use. You can depend on it for tasks such as web browsing, working with Microsoft Office applications and multimedia playback. The laptop handles Full HD (1080p) media playback, for instance on Youtube videos, like a charm. Additionally, thanks to the processor, it handles 4K video smoothly and with flair. On gaming, the laptop struggles because of its basic integrated Intel UHD graphics 620. That limits the laptop from playing modern AAA titles but the CPU power allows some few games to be playable at low frame rates. Take a look at the gaming on Intel UHD 620 video to better understand how far it goes. Considering that our reviewed unit is 15.6 inches, the keyboard and touchpad had plenty of space to be fitted. As a result, they’re generously-sized to accommodate even larger hands and palms. The keys have deep travel and require a satisfying amount of actuation force to register input. That makes the keyboard easy to use for long hours. Our unit, however, doesn’t offer any backlighting or number pad, but an option with a backlit numeric keyboard is an optional choice you can have with the configurations available. The trackpad is also sufficiently sized and is slightly left aligned. It has no Precision drivers leaving the trackpad without gesture control capacity. You can opt to use a mouse here to ease the burden. Windows 10 gestures are not operable on the trackpad. Lenovo has been for a long time the gold standard for business laptops with their sturdy and carbon fiber aesthetics and no-nonsense looks. Well, the Lenovo Ideapad 330 81DE00L0US is no business laptop and doesn’t brag of head-turning design either. It is one of Lenovo’s most modest designs yet featuring the simplest styles but without compromising on quality. The keyboard and trackpad are also decent and it packs the latest in processor technology. We loved it for its performance in daily home office tasks which it excels at. To sum it all up, it is a very capable laptop ad if you can overlook it a few flaws you’ll have yourself an affordable laptop for everyday tasks.